Living in a big city sometimes makes your opinions on agriculture suspect. What do you know about farming? Enter Darryl Coates, keeper of bees, skinner of rabbits and wildlife biologist for the Illinois Department of Natural Resources. Which is all to say, Darryl brings a rural viewpoint to the conversation. And he brings the perspective of someone who’s spent over 17 years working to manage Illinois wildlife and tree populations. He has a field scientist’s perspective on natural systems and applies that thinking to his analysis of agriculture. As he puts it, his science is “adaptive management”. He notes that wild animal populations live outside, they have exposure to a varied diet of their choosing and they are exposed to the elements and illness. Barring unregulated hunting pressure, this creates a resilient system and healthy animals. Of course farming and agriculture is an artificial system man creates, but in Darryl’s mind, we would be better served learning from and more closely imitating nature’s systems. Use waste in positive manner. The herd is not kept all together (and sick animals are separated). You don’t need hormones and inoculations. When these get out of balance, in nature or on farms, you have population corrections of animals, plants or soil through disease, pollution and starvation. Speaking of balance, one of nature’s pillars of success that Darryl fears we are most ignoring, is diversity. Large scale agriculture often purports to offer us “choice”, but Darryl doesn’t see it. We grow one corn type in this country: “yellow dent #2”. How is that choice? How is that diversity? To the naturalist’s mind, this is life on a knife edge because we are only fostering one crop, one species. If blight or drought or a yellow-dent-#2-loving pest hits that crop, we may be sorry to have all our eggs in one basket. And Darryl recalled the steak taste-test we did together at Spence Farm chef camp (see Meal Two posts for more on Spence Farm). 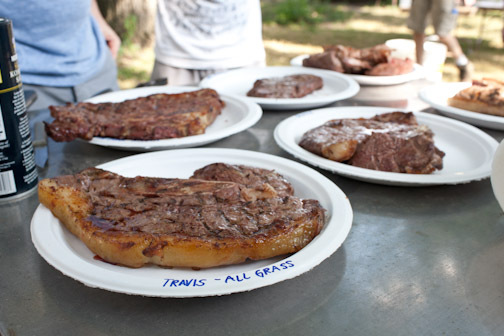 We grilled six steaks, some pastured, some grain-fed, some grain finished and also from a variety of species, Angus, Holstein and more, including an anonymous commodity steak from the grocery store. Did they taste different? Oh YES! Does agriculture foster that sort of choice? No, it raises one beef cattle, feeds it the same across the country and it tastes the same everywhere. Is that consumer choice? Is that an environmentally safe move from the perspective of a wildlife biologist who values diversity? No. I read a terrific essay recently by Seth Teter that compared monoculture farming to monoculture thinking. He essentially challenges us to be broad thinkers and avoid the dogma that is monoculture ideology. If you are a proponent of biological diversity, he says, you should also be a proponent of thought diversity. I fully agree. I think Darryl brings us some diversity thinking. He acknowledges that agriculture, all agriculture, is a better steward of the land than it’s ever been. But he fears the monoculture planting, the monoculture thinking that ag is chasing now too. In economics terms, you could see on his face and read in his tone that he fears a “correction”. When the correction hits, will we see it as nature’s response to our widespread use of single crops and single species?